Dialectics and DBT involve bringing together opposites in considering what’s being left out. Dialectical dilemmas are behavioral patterns noticed in individuals with BPD. The patient fluctuates between two ends of each dilemma. Balancing the dialectical dilemmas is a task of therapy. 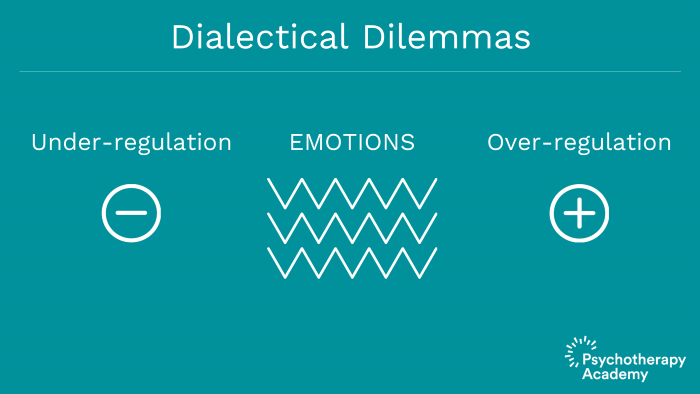 What is the meaning of Dialectics in DBT? 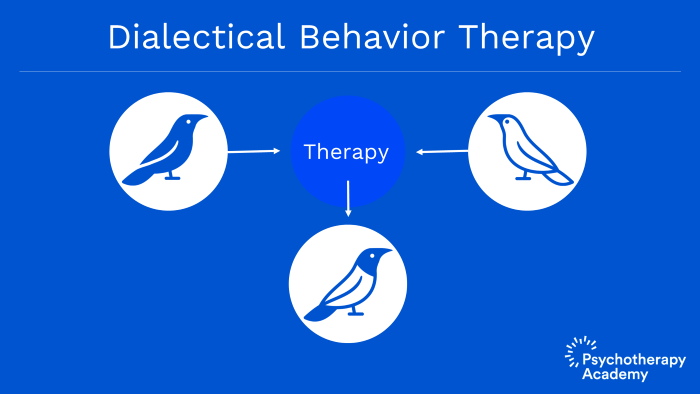 Dialectics as it applies to dialectical behavior therapy involves the therapist’s stance in helping the patient bring together seemingly opposites throughout therapy reconciling some of the conflict that happens both within themselves and in the therapeutic relationship. Dialectics is if you’ve ever seen any of the visuals, the optical illusion pictures where you can see multiple pictures in one, sometimes you can see two, sometimes you can see three, that would be a dialectic. The reason is because if one person looks at the picture, they might see two people looking at one another. And if another person looks at the picture, they might see a cup in the middle. 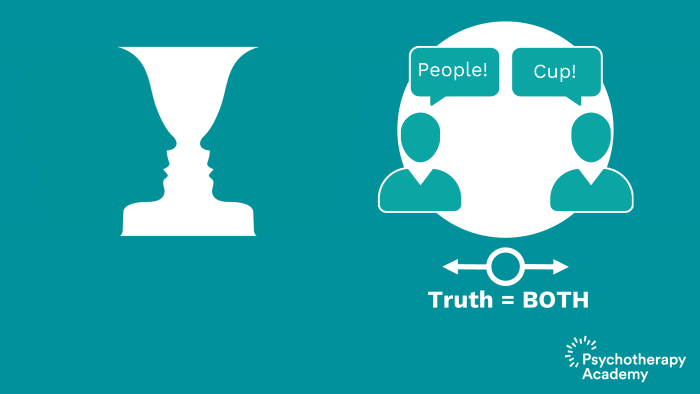 But the truth lies somewhere in the middle or more so of a combination. So there may be both a couple looking at one another and a cup in the middle and then there is the gestalt of the entire picture. So it’s not two people looking at one another. It’s not a cup in the middle. It is both at the same time. And so an optical illusion like that would be an example of a dialectic. So how does that apply in therapy? Some of the common dialectics with DBT clients would be the client seeming to want to die and seeming to also not want to die. Some of the mistakes that non-DBT therapists will make -and DBT therapists also- are trying to figure out which it is. Does the client want to live? Or does the client want to die? And that’s not taking a step back and looking at the entire picture. The client both wants to live and to die at the same time. How can that be? If you have ever wanted to get in shape, if I were to ask, “Do you want to get in shape?” you might say yes and no. So we can recognize those dialectical dilemmas within ourselves. Part of being a DBT therapist involves identifying when we get fixed on one end where perhaps we’re saying the couple looking at one another, and our client gets fixed on the other end, they see a cup. And then we’re arguing between ourselves about whether it’s a cup or two people looking at one another. Is the dress blue and black or is it gold and white? Those are examples of dialectics because it’s in the eye of beholder or in the ear of the beholder as to which you hear or which that you see. But the truth, it exists. There is truth in both sides. 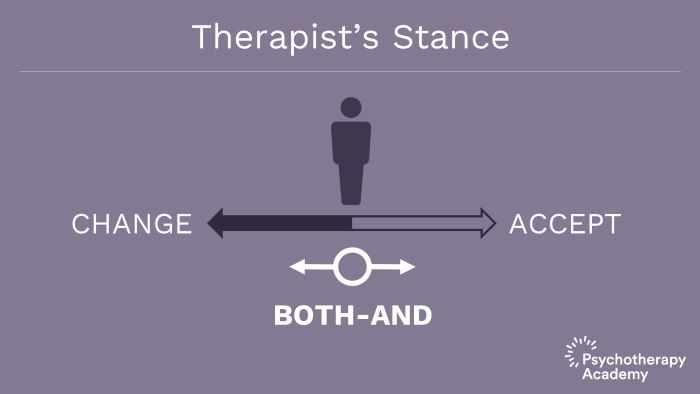 The therapist’s stance again fluctuating between change, trying to change the patient and trying to accept the patient at the same time. Those seem to be at opposite ends of the spectrum. Well, which is it? Are we trying to change the patient? Or are we accepting them as they are in this moment? It’s both-and. Both-and is a common refrain in dialectical behavior therapy. We replace the term but with and. You may see DBT patients who have been in treatment for a little while revise a statement that they’ve made using “but” and replace it with “and” because there’s been so much practice of that. 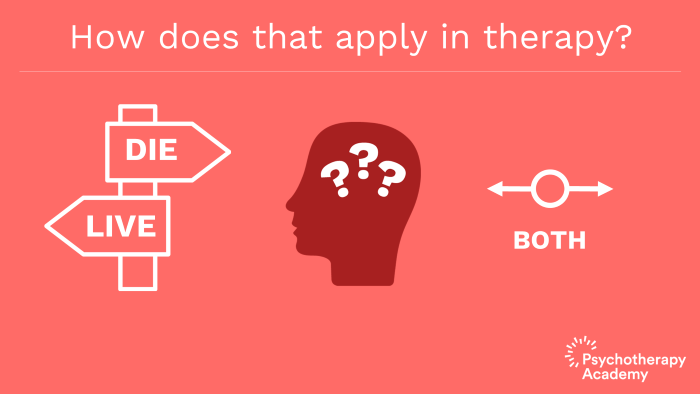 The dialectical dilemmas are behavioral patterns that are recognized in therapy. The therapist will notice certain dilemmas that are common for patients with borderline personality disorder and other patients as well that come up in therapy that need to be resolved. It involves both over and under regulation of emotional expression. Resolving these is the task of therapy. The dialectical dilemmas are one of those things that are more difficult to explain and thus would need to be gone into more depth in another section. Our key points are that dialectics and DBT involve bringing together opposites in considering what’s being left out. 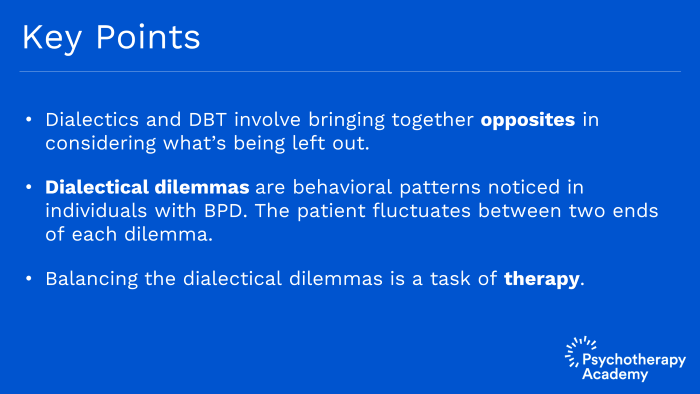 Dialectical dilemmas are behavioral patterns noticed in individuals with BPD. The patient fluctuates between two ends of each dilemma. Balancing the dialectical dilemmas is a task of therapy.